My name is Ryann and, like many twenty-somethings spending summer in the city, I’m always on the lookout for great spots to hang with friends, bond with coworkers, or flirt with dates. As a native Chicagoan, I know that this city is full of great spots to eat and drink. I’ve rounded up the best places in the city for you to put the “happy” in Happy Hour! What makes you happy? If you’re like me, the answer is delicious drinks and amazing appetizers at perfect prices! Executive Chef Joshua Hasho takes the lead from the restaurant’s entirely locally grown produce and transforms each dish into a culinary farm-to-table experience. Whether you’re in the mood for a ribeye or a cheese plate, this place has it all, with sweeping views of North Michigan Avenue to match. “Happy Hour gives people a chance to try things from all of the great restaurants Chicago has to offer,” Katz said. “Having affordable options that also taste great is a big draw for the younger crowd to come and network and get to know coworkers,” Communications and Market Research Coordinator Kristen Lang added. Seasoned with herbs and spices from their fifth floor skydeck garden, the Margherita Flatbread evokes the tastes of Italy in just one slice. The Cheese and Charcuterie plate provides endless options, including house favorite – bacon jam – for diners to create the perfect bite every time. 676 Restaurant’s Happy Hour offerings are a new feature at the hotel and are sure to become a staple of the Chicago dining experience. When you think of rooftop views, you may not immediately think of Gino’s East. But, the newly renovated rooftop patio at the Magnificent Mile location offers everything you could need to relax and enjoy Happy Hour. Take a seat at a table or comfy couch and enjoy the wrap-around patio while being served from the full bar or kitchen. Gino’s is offering your quintessential Happy Hour specials for the first time, beginning this year. If you’re in the mood for a brew and some tunes, Gino’s River North location just a few blocks away offers live music from Matt Keen of Rebel Soul Revival and $5 pints of Gino’s Brewing Company beers. More of those craft beers will be coming to The Magnificent Mile location soon. Whether you are looking for a fun place to come for famous deep dish with the family or a hip spot for after-work drinks and snacks, Gino’s East delivers. “We have our patrons who come in all the time and offering the new Happy Hour is a fun way to keep making them happy,” Goldsberry said. At Harry Caray’s Italian Steakhouse, fine dining meets your neighborhood hangout with everything from perfectly cooked filets to an ice-cold beer. Surrounded by the spirit of Harry Caray himself, the Steakhouse bar makes for a great place to meet friends after work or catch a Cubs game. From celebrity photos to Chicago Cubs paraphernalia, there are pieces of the city wherever you look. For you history buffs, slip downstairs to check out the gangster-era vault, secret hallway, and old address book filled with mobsters’ contact information. The artifacts once belonged to mob enforcer Frank Nitti. From their delightful appetizer menu to their ever-changing featured cocktail special, the crew at Harry Caray’s does not disappoint. The rooftop lounge of the Godfrey Hotel has the full Happy Hour package. From great views of the neighborhood to irresistible food and drinks, there are tons of reasons to do Happy Hour at I|O Godfrey. I|O Godfrey is the perfect place for brunch, drinks, or a night on the town with a wonderful round up of menu items, including Prime Beef Sliders, Truffle Fries, and Salmon Avocado Maki. On Friday’s, sneak away to I|O Godfrey for a mid-day pick-me-up thanks to their afternoon hours. Osteria puts an authentic Italian spin on their Happy Hour, following the tradition of “Aperitivo,” where alcoholic beverages are served before the meal to help stimulate the appetite. The ever-changing wine selection at Osteria remains true to tradition and is limited to unique, small production Italian wines, while the cocktail menu features signature recipes such as the Prosecco Fizz. The restaurant is known for their light and flavorful Italian Sangria which includes red or white wine and fresh fruit. No matter why you choose to come to Osteria, you can be sure you’ve made the right choice when you try Chef DiGregorio’s homemade roasted garlic, marinated olives, and ciabatta bread. These delicious bites are complimentary with your Aperitivo experience. While the atmosphere may be “old world,” Osteria does its part to go green by recycling old menus into coasters. If a trip to Italy is on your bucket list, get your taste buds ready with a trip to Osteria Via Stato! The ultimate intimate experience awaits at State and Lake Chicago Tavern. With food as beautiful as the space – and as delicious as it is beautiful –, Executive Chef Nathan Sears always delivers a satisfying meal, whether it is for lunch, dinner, or their famous Happy Hour. That includes putting a modern and unique flare on traditional tavern dining. 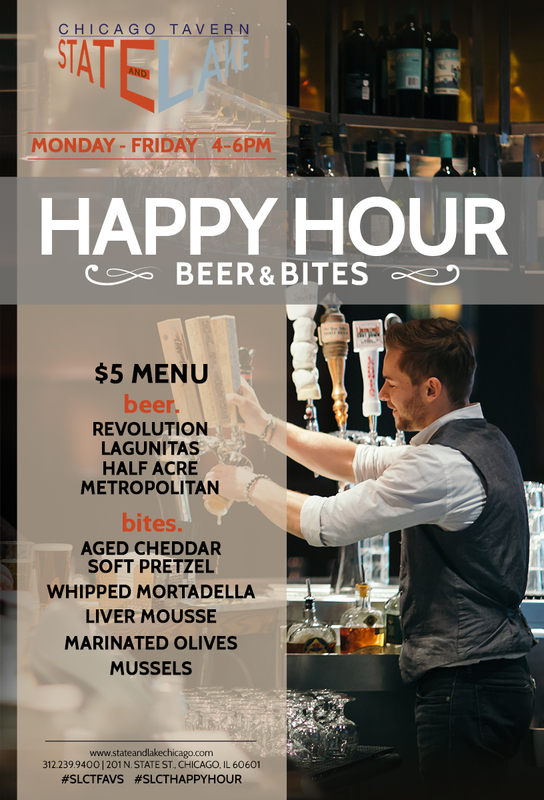 Happy Hour brews include Revolution and Metropolitan selections to pair with mussels, whipped mortadella or their most popular bite: the aged cheddar soft pretzel. Whether you want to grab a drink after work, join with friends to watch a game, or take a special someone to a romantic meal for two, State and Lake Chicago Tavern’s Happy Hour caters to all.